uuid : 4f69e0f0-aa60-4963-969c-620d962aa8d7 templates_id: 119513 templates_uuid: "2f533831-0444-41b1-af70-6d3096261b60" title: "Car Sale Agreement - Vehicle Bill of Sale - Sell a Vehicle " display_name: "Vehicle bill of sale" meta_keywords: "Car sale contract and Car bill of sale" description: "
Sell a car with confidence with this car sale agreement. This vehicle bill of sale should be used if you\'re a private individual wishing to create a full and final \'sold as seen\' car sale contract. It covers all the relevant information about the seller and buyer, all the necessary DVLA information about the vehicle, along with the price and payment of the sale. A vehicle bill of sale, or car sale agreement is an agreement under which a vehicle is sold. It records the transaction between the seller and the buyer, and outlines the conditions for the transfer of ownership of the vehicle. Why do I need a vehicle bill of sale? Whether you are a seller or a buyer, a vehicle bill of sale is a very useful document as it keeps a written record of the transaction and provides proof of the purchase. For a seller: a vehicle bill of sale expressly states that the vehicle is \'sold as seen\' so there can be no future argument over the condition of the car. 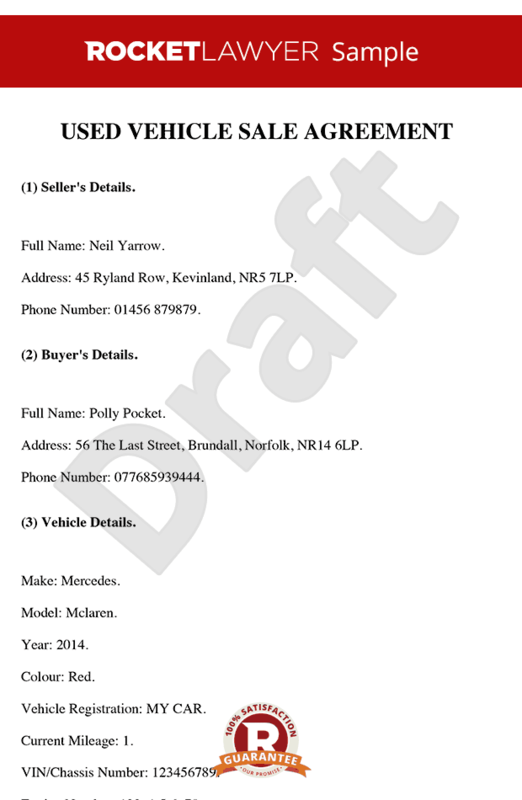 For a buyer: a vehicle bill of sale details the vehicle information and ensures you know exactly what you are buying. What is a \'sold as seen\' agreement? Indicating in a car sale contract that the vehicle is \'sold as seen\' - or on an \'as is\' basis - ensures that the seller is not liable for any flaws or damages related to the vehicle. It protects the seller from liability if the buyer has any problem with the car after purchase, for example if the motor breaks down. Under a car sale contract, the seller confirms that they will provide the buyer with the vehicle in accordance with the terms of sale. The buyer agrees to pay the set price on the agreed date, and acknowledges that the vehicle is \'sold as seen\', without any warranty from the seller. When should the vehicle bill of sale be signed? The vehicle bill of sale should be signed when the car switches hands from the purchaser to the buyer, usually on receipt of full payment from the buyer. Each party should keep a copy of the bill for their records. This agreement for the sale of a vehicle is governed by the law of England and Wales.
" created_timestamp: "2018-10-08 04:36:32.0" modified_timestamp: "2018-10-08 04:36:32.0" active: true created_by: 157 modified_by: 157 dcm_id: 297 url_slug: "Agreement-for-sale-of-vehicle" meta_description: "Sell a car using this template car sale agreement with help from Rocket Lawyer. Ensure the car bill of sale is a legally binding contract. Try this car sale contract for free." time_to_complete: "10 minutes"
Sell a car with confidence with this car sale agreement. This vehicle bill of sale should be used if you're a private individual wishing to create a full and final 'sold as seen' car sale contract. It covers all the relevant information about the seller and buyer, all the necessary DVLA information about the vehicle, along with the price and payment of the sale. For a seller: a vehicle bill of sale expressly states that the vehicle is 'sold as seen' so there can be no future argument over the condition of the car. What is a 'sold as seen' agreement? Indicating in a car sale contract that the vehicle is 'sold as seen' - or on an 'as is' basis - ensures that the seller is not liable for any flaws or damages related to the vehicle. The buyer agrees to pay the set price on the agreed date, and acknowledges that the vehicle is 'sold as seen', without any warranty from the seller. More than just a Vehicle bill of sale template, our step-by-step interview and guidance makes it easy to create your document. Easily create online, download, print and sign your free Vehicle bill of sale in minutes. This document is also sometimes called: Car sale contract and Car bill of sale.